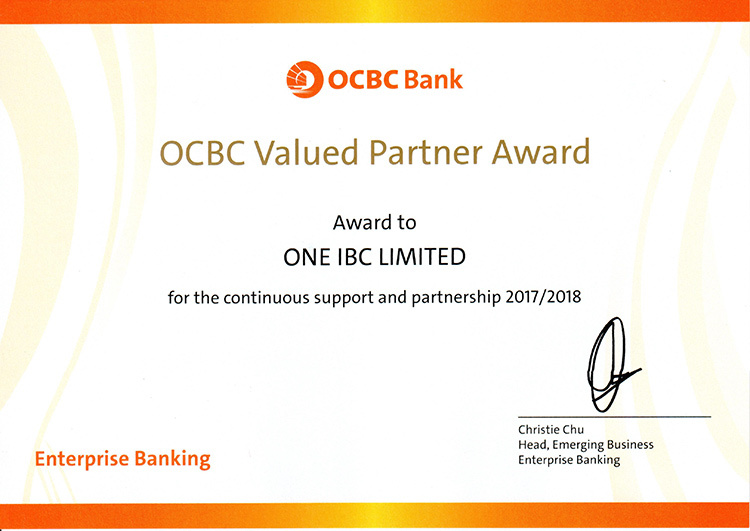 One IBC Limited has been awarded the valued partner for the continuous support and partnership 2017/2018 from OCBC Bank. The award confirms that One IBC Limited has a strong and long-term relationship with OCBC Bank, which is the longest established Singapore bank and now is the second largest financial services group in Southeast Asia by assets and one of the world’s most highly-rated banks. OCBC has expertized in financial services to individual and business. They offer a comprehensive range of financial and wealth management services. Recognised for its financial strength and stability, OCBC Bank is consistently ranked among one of the Safest Banks by Global Finance and has been named Best Managed Bank in Singapore and the Asia Pacific by The Asian Banker. As a valued partner from OCBC is proud to be awarded and recognized our achievement in providing our clients with the assurance that we meet industry best practice and that the processes adapt to international standards. Therefore, choosing the partner is also a vital part of core values of One IBC Limited. One IBC/Offshore Company Corp together with OCBC Bank has been bringing lasting value and the best solutions for Offshore Company Corp and Offshore Bank Account practices to the prosperity of clients.